I know it has been the fattest minute since I have written to you guys, but such is life. This is definitely a hobby and adults don’t always have time to indulge in their hobbies. Buuuuut, I saw this film a few weeks ago with my boyfriend and holy hell y’all, I didn’t think Jordan Peele could come up with anything more original than Get Out until I saw Us. Us (2019) is a film about doppelgängers. If you have an irrational fear of doppelgängers, I highly suggest you skip this film. I have ALWAYS been afraid of having an evil doppelgänger somewhere, so this movie really got me. When we begin the movie, Adelaide is a little girl with her parents in California on a pier carnival. She walks off from her parents to explore a closed funhouse on the beach where she encounters an exact copy of herself where a mirror should have been. Ever since, she knows that there is another person identical to her in the world. Fast forward –> she is married with two kids and is with her family on the way to their beach house when she confesses to her husband that there she has a doppelgänger, a secret she has carried for her entire life. After this confession, a family of doppelgängers of her exact family break into the house. Then the games begin. I think what I appreciated most in this film was the symbolism. This film is FULL of it, and it is such fresh air compared to Get Out. I loved Get Out, but Us is so much more of a traditional horror film in the sense that nothing like it has been done before…other than a million other times. Do you love a good stereotype? How about one of a scientific experiment gone wrong? Because, even though it is open to interpretation, I am almost 100% sure that this is where the doppelgängers in this film were a result of. A forgotten experiment full of subjects living in an underground bunker with only rabbits as a source of nutrition, I find it hard to believe that this could be anything else. 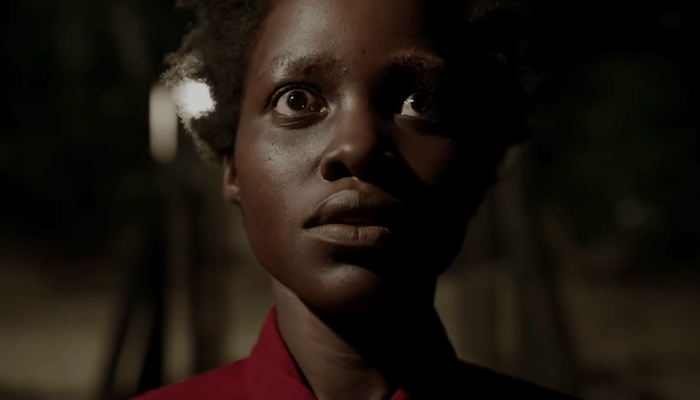 The cast in Us (2019) was carefully chosen, as though it was handpicked by film gods (or, Jordan Peele). The chemistry between Adelaide and her family members is incredible, as if they had really known each other their entire lives and decided to reenact their family’s life troubles. The cinematographers did not rely on crazy gore scenes or erratic film angles to get their point across. Probably because they didn’t have to. The story itself was way too important to distract the audience, but the creators do expect you to pay very close attention. Many of the elements in the film are so subtle, yet reoccurring that they are often overlooked. But, once you see it once, you see it over and over again. I noticed things that my boyfriend did not, and he noticed things that I did not. Sometimes we both saw elements, but did not notice them initially at the same time. The most interesting element of this film, however, is the fact that Red can speak English when her other colleagues cannot speak coherently at all. They speak in grunts and moans. This is a touch on mental illness that results from trauma, and I am afraid that I cannot say more than that without completely spoiling the entire film (for those of you that have not yet had the change to see it).